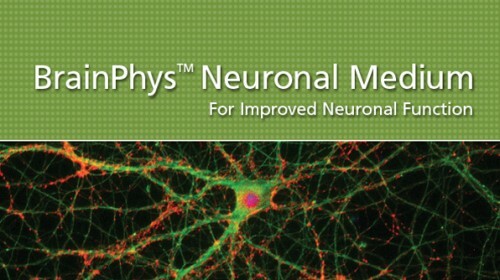 BrainPhys™ Neuronal Medium is a serum-free neuronal basal medium. 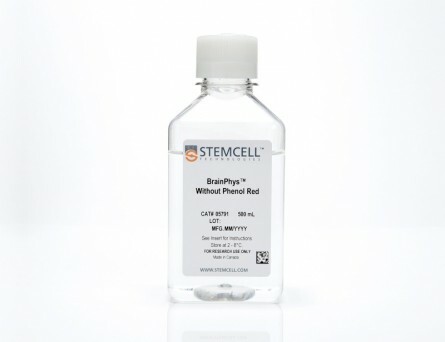 BrainPhys™ may be used to culture primary neurons or neurons derived from human pluripotent stem cells (hPSCs). Based on the formulation published by Cedric Bardy and Fred H. Gage (C Bardy et al. 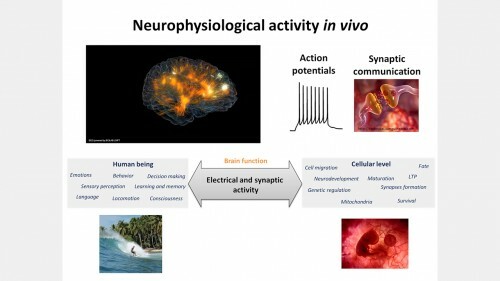 PNAS, 2015), BrainPhys™ is more representative of the central nervous system extracellular environment and increases the proportion of synaptically active neurons. 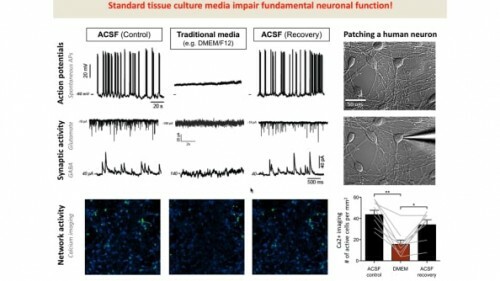 Applications of BrainPhys™ Neuronal Medium include culture of primary neurons, differentiation and maturation of hPSC-derived neurons, microelectrode array-based recording of neuronal activity, live fluorescent imaging (including calcium imaging and optogenetics) and transdifferentiation of somatic cells to neurons. To ensure cell survival in long-term serum-free culture, BrainPhys™ must be combined with an appropriate supplement. 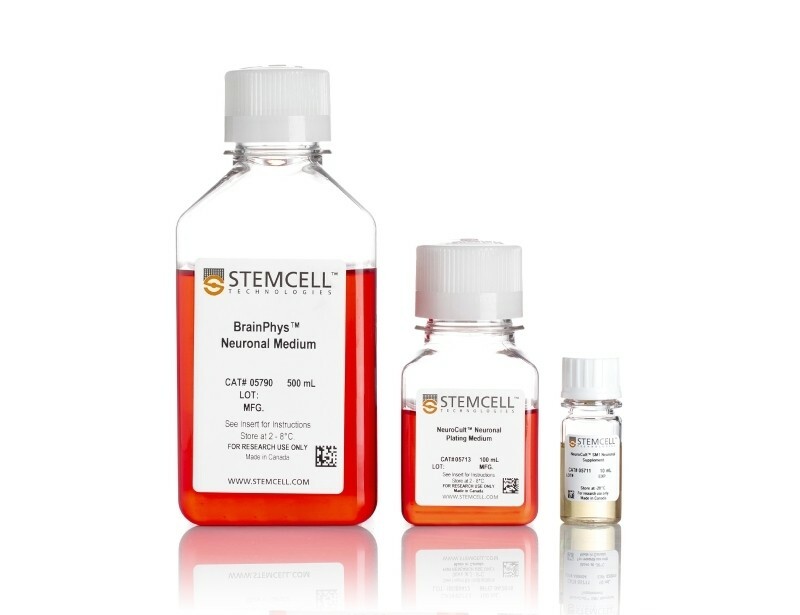 For your convenience, various BrainPhys™ kits are available for primary or hPSC-derived neurons. 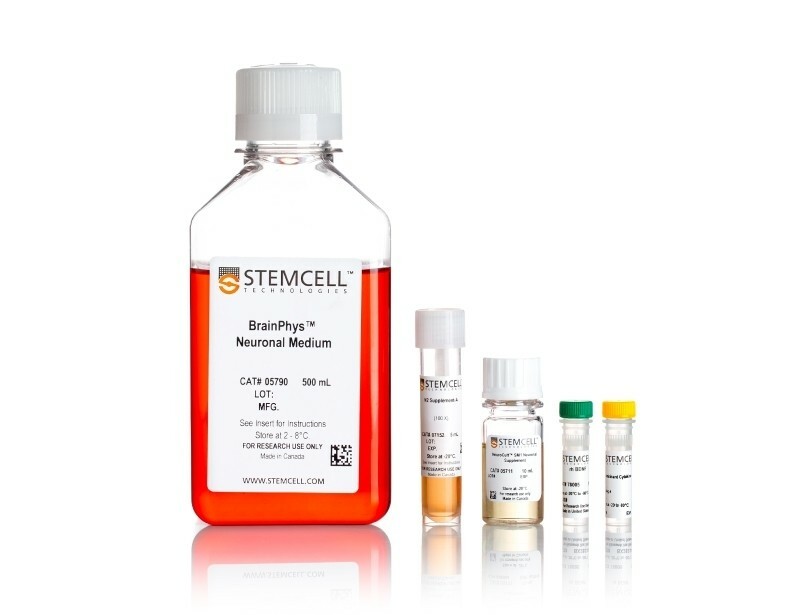 BrainPhys™ Neuronal Medium and SM1 Kit (Catalog #05792) is recommended for culture of primary neurons. 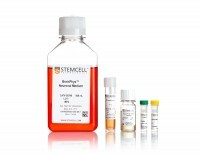 BrainPhys™ Primary Neuron Kit (Catalog #05794) is recommended for plating and culture of primary neurons. 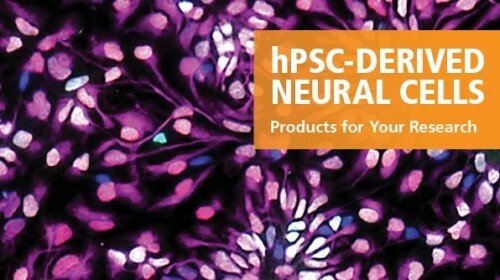 BrainPhys™ Neuronal Medium N2-A & SM1 Kit (Catalog #05793) and BrainPhys™ hPSC Neuron Kit (Catalog #05795) are recommended for the differentiation and maturation of hPSC-derived neurons, in combination with lineage-specific growth factors and/or small molecules (if necessary). Check-mark denotes physiological conditions and supported activities according to C Bardy et al. Proc Natl Acad Sci USA, 2015. Primary rodent tissue dissociated in papain was plated in NeuroCult™ Neuronal Plating Medium, supplemented with NeuroCult™ SM1 Neuronal Supplement, L-Glutamine, and L-Glutamic Acid. On day 5, primary neurons were transitioned to BrainPhys™ Neuronal Medium, supplemented with NeuroCult™ SM1 Neuronal Supplement, by performing half-medium changes every 3 - 4 days. hPSCs were maintained in mTeSR™1 medium and then differentiated using the STEMdiff™ SMADi Neural Induction Kit. 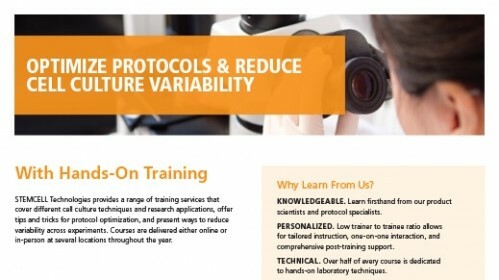 Following plating on PLO/laminin, half-medium changes were performed to transition to BrainPhys™ Neuronal Medium for maturation and long-term culture. Primary E18 rat cortical neurons were cultured in the SM1 Culture System. A large number of viable neurons are visible after (A) 21 and (B) 35 days, as demonstrated by their bright neuronal cell bodies, and extensive neurite outgrowth and branching. Neurons are evenly distributed over the culture surface with minimal cell clumping. 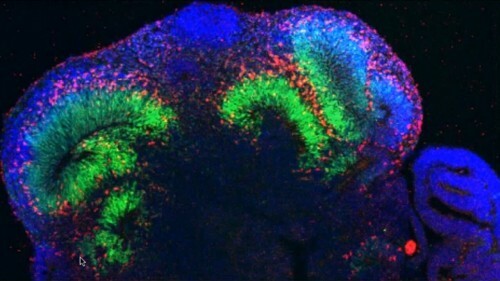 Primary E18 rat cortical neurons were cultured in the SM1 Culture System. At 21 DIV, neurons are phenotypically mature, as indicated by the presence of an extensive dendritic arbor, and appropriate expression and localization of pre-synaptic synapsin (A,C; green) and post-synaptic PSD-95 (A,B; red) markers. Synapsin is concentrated in discrete puncta distributed along the somata and dendritic processes, as defined by the dendritic marker MAP2 (A,D; blue). (A) Primary E18 rat cortical neurons were cultured in the SM1 Culture System or a Competitor Culture System for 21 days. Neurons cultured in the SM1 Culture System have a significantly higher number of viable cells compared to the competitor culture system (n = 4; mean ± 95% CI; *p < 0.05). (B) Primary E18 rat cortical neurons were cultured in Neurobasal® supplemented with NeuroCult™ SM1 Neuronal Supplement (SM1) or competitor B27-like supplements (Competitor 1,2,3) for 21 days. Cultures supplemented with NeuroCult™ SM1 Neuronal Supplement have an equal number of neurons compared to competitor-supplemented cultures. Bars represent standard error of mean. 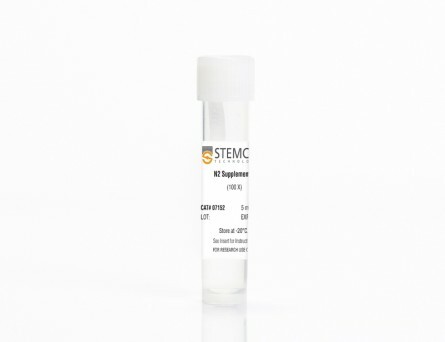 (A,C) Primary rat E18 cortical neurons were plated in NeuroCult™ Neuronal Basal Medium (product superseded with NeuroCult™ Neuronal Plating Medium which is a part of the BrainPhys™ Primary Neuron Kit), supplemented with NeuroCult™ SM1 Neuronal Supplement. After 5 DIV, the cultures were transitioned to BrainPhys™ Neuronal Medium, supplemented with NeuroCult™ SM1 Neuronal Supplement, by performing half-medium changes every 3 - 4 days. 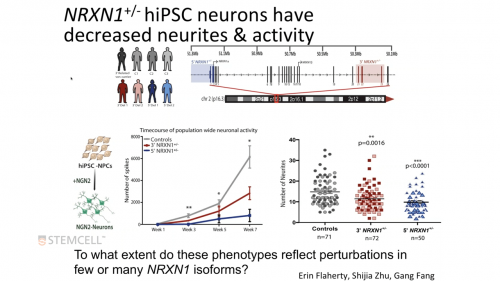 Neurons were cultured for 21 DIV. 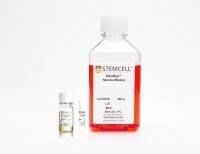 (B,D) Primary rat E18 cortical neurons were plated and matured in a competitor neuronal medium (Neurobasal®), supplemented with NeuroCult™ SM1 Neuronal Supplement for 21 DIV. (A,C) Neurons matured in BrainPhys™ Neuronal Medium showed spontaneous excitatory (AMPA-mediated; A) and inhibitory (GABA-mediated; C) synaptic events. The frequency and amplitude of spontaneous synaptic events is consistently greater in neuronal cultures matured in BrainPhys™ Neuronal Medium, compared to neurons plated and matured in a competitor neuronal medium (B,D). Traces are representative. 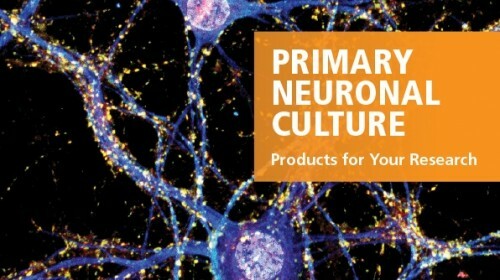 Primary rat E18 cortical neurons were plated in a competitor neuronal medium (Neurobasal®) supplemented with NeuroCult™ SM1 Neuronal Supplement. After 5 DIV, half of the cultures were transitioned to BrainPhys™ Neuronal Medium, supplemented with NeuroCult™ SM1 Neuronal Supplement, by performing half-medium changes every 3 - 4 days. The other half of the cultures were maintained in the competitor neuronal medium throughout. The electrical activities of the neuronal cultures were measured twice a week using a microelectrode array (MEA) system (Axion Biosystems). (A) The mean firing rate of neurons cultured in BrainPhys™ Neuronal Medium increases over time, whereas the mean firing rate of neurons in the competitor neuronal medium condition remains low (n = 1; mean ± SEM, 128 electrodes). (B) The percentage of active electrodes (>0.005 Hz) of neurons matured in BrainPhys™ Neuronal Medium increases from 24% on day 14 to 69% on day 21, and then remains stable at 60 – 70% from days 21 – 44. In contrast, < 5% of electrodes was active in the competitor neuronal medium condition over the same 6-week period. NPCs were generated from H9 cells using STEMdiff™ Neural Induction Medium in an embryoid body-based protocol. Next, NPCs were cultured for 44 DIV in (A) BrainPhys™ Neuronal Medium, supplemented with 2% NeuroCult™ SM1 Supplement, 1% N2 Supplement-A, 20 ng/mL GDNF, 20 ng/mL BDNF, 1 mM db-cAMP and 200 nM ascorbic acid to initiate neuronal differentiation, or (B) DMEM/F12 under the same supplementation conditions. 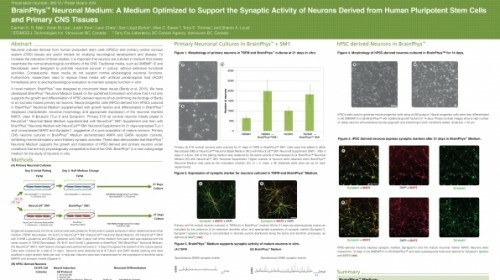 Neuronal cultures differentiated from NPCs in BrainPhys™ Neuronal Medium display extensive neurite outgrowth and reduced cellular debris compared to cultures differentiated in DMEM/F12. Scale bar= 100 µm. 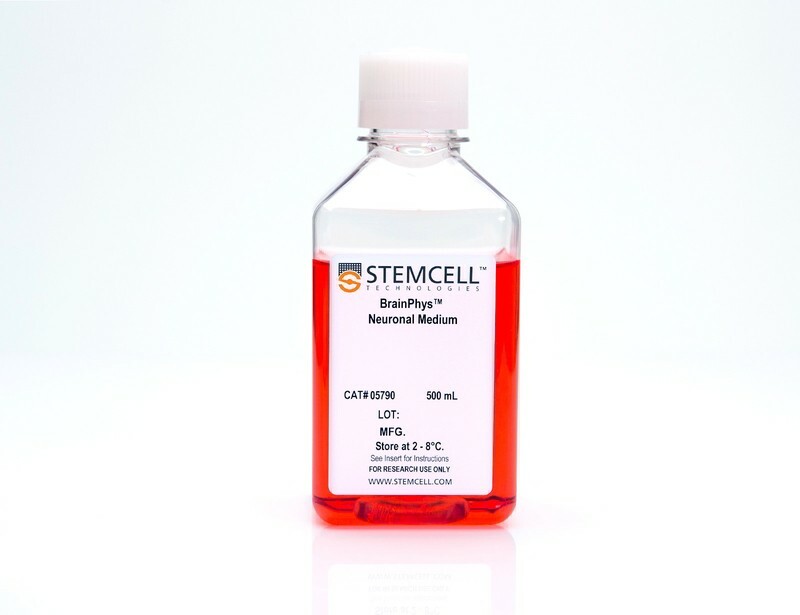 NPCs were generated from H9 cells using STEMdiff™ Neural Induction Medium in an embryoid body-based protocol. Next, NPCs were cultured for 44 DIV in (A,C) BrainPhys™ Neuronal Medium, supplemented with 2% NeuroCult™ SM1 Supplement, 1% N2 Supplement-A, 20 ng/mL GDNF, 20 ng/mL BDNF, 1 mM db-cAMP and 200 nM ascorbic acid to initiate neuronal differentiation, or (B,D) in DMEM/F12 under the same supplementation conditions. (A,C) Neurons matured in BrainPhys™ Neuronal Medium showed spontaneous excitatory (AMPA-mediated; A) and inhibitory (GABA-mediated; C) synaptic events. The frequency and amplitude of spontaneous synaptic events is consistently greater in neuronal cultures matured in BrainPhys™ Neuronal Medium, compared to neurons plated and matured in DMEM/F12 (B,D). Traces are representative. 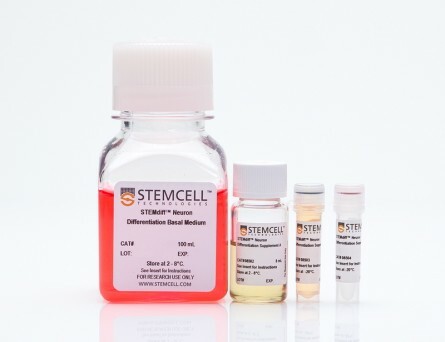 Rapid and efficient induction of functional astrocytes from human pluripotent stem cells. 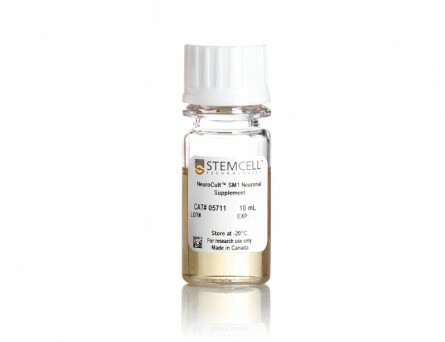 The derivation of astrocytes from human pluripotent stem cells is currently slow and inefficient. We demonstrate that overexpression of the transcription factors SOX9 and NFIB in human pluripotent stem cells rapidly and efficiently yields homogeneous populations of induced astrocytes. 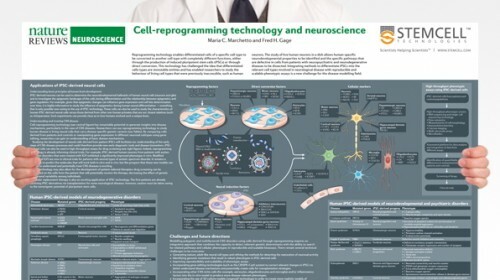 In our study these cells exhibited molecular and functional properties resembling those of adult human astrocytes and were deemed suitable for disease modeling. Our method provides new possibilities for the study of human astrocytes in health and disease. A homozygous loss-of-function CAMK2A mutation causes growth delay, frequent seizures and severe intellectual disability. P. H. Chia et al. Calcium/calmodulin-dependent protein kinase II (CAMK2) plays fundamental roles in synaptic plasticity that underlies learning and memory. Here, we describe a new recessive neurodevelopmental syndrome with global developmental delay, seizures and intellectual disability. Using linkage analysis and exome sequencing, we found that this disease maps to chromosome 5q31.1-q34 and is caused by a biallelic germline mutation in CAMK2A. The missense mutation, p.His477Tyr is located in the CAMK2A association domain that is critical for its function and localization. Biochemically, the p.His477Tyr mutant is defective in self-oligomerization and unable to assemble into the multimeric holoenzyme.In vivo, CAMK2AH477Y failed to rescue neuronal defects in C. elegans lacking unc-43, the ortholog of human CAMK2A. In vitro, neurons derived from patient iPSCs displayed profound synaptic defects. Together, our data demonstrate that a recessive germline mutation in CAMK2A leads to neurodevelopmental defects in humans and suggest that dysfunctional CAMK2 paralogs may contribute to other neurological disorders. Acute Physiology and Neurologic Outcomes after Brain Injury in SCOP/PHLPP1 KO Mice. T. C. Jackson et al. Suprachiasmatic nucleus circadian oscillatory protein (SCOP) (a.k.a. PHLPP1) regulates long-term memory consolidation in the brain. Using a mouse model of controlled cortical impact (CCI) we tested if (1) brain tissue levels of SCOP/PHLPP1 increase after a traumatic brain injury (TBI), and (2) if SCOP/PHLPP1 gene knockout (KO) mice have improved (or worse) neurologic outcomes. Blood chemistry (pH, pCO2, pO2, pSO2, base excess, sodium bicarbonate, and osmolarity) and arterial pressure (MAP) differed in isoflurane anesthetized WT vs. KOs at baseline and up to 1 h post-injury. CCI injury increased cortical/hippocampal SCOP/PHLPP1 levels in WTs 7d and 14d post-injury. Injured KOs had higher brain tissue levels of phosphorylated AKT (pAKT) in cortex (14d post-injury), and higher levels of phosphorylated MEK (pMEK) in hippocampus (7d and 14d post-injury) and in cortex (7d post-injury). Consistent with an important role of SCOP/PHLPP1 on memory function, injured-KOs had near normal performance on the probe trial of the Morris water maze, whereas injured-WTs were impaired. CA1/CA3 hippocampal survival was lower in KOs vs. WTs 24 h post-injury but equivalent by 7d. No difference in 21d cortical lesion volume was detected. SCOP/PHLPP1 overexpression in cultured rat cortical neurons had no effect on 24 h cell death after a mechanical stretch-injury. Mitochondrial Aging Defects Emerge in Directly Reprogrammed Human Neurons due to Their Metabolic Profile. Mitochondria are a major target for aging and are instrumental in the age-dependent deterioration of the human brain, but studying mitochondria in aging human neurons has been challenging. Direct fibroblast-to-induced neuron (iN) conversion yields functional neurons that retain important signs of aging, in contrast to iPSC differentiation. Here, we analyzed mitochondrial features in iNs from individuals of different ages. iNs from old donors display decreased oxidative phosphorylation (OXPHOS)-related gene expression, impaired axonal mitochondrial morphologies, lower mitochondrial membrane potentials, reduced energy production, and increased oxidized proteins levels. In contrast, the fibroblasts from which iNs were generated show only mild age-dependent changes, consistent with a metabolic shift from glycolysis-dependent fibroblasts to OXPHOS-dependent iNs. Indeed, OXPHOS-induced old fibroblasts show increased mitochondrial aging features similar to iNs. Our data indicate that iNs are a valuable tool for studying mitochondrial aging and support a bioenergetic explanation for the high susceptibility of the brain to aging. CaMKII Metaplasticity Drives Abeta$ Oligomer-Mediated Synaptotoxicity. Alzheimer's disease (AD) is emerging as a synaptopathology driven by metaplasticity. Indeed, reminiscent of metaplasticity, oligomeric forms of the amyloid-beta$ peptide (oAbeta$) prevent induction of long-term potentiation (LTP) via the prior activation of GluN2B-containing NMDA receptors (NMDARs). However, the downstream Ca2+-dependent signaling molecules that mediate aberrant metaplasticity are unknown. In this study, we show that oAbeta$ promotes the activation of Ca2+/calmodulin-dependent kinase II (CaMKII) via GluN2B-containing NMDARs. Importantly, we find that CaMKII inhibition rescues both the LTP impairment and the dendritic spine loss mediated by oAbeta$. Mechanistically resembling metaplasticity, oAbeta$ prevents subsequent rounds of plasticity from inducing CaMKII T286 autophosphorylation, as well as the associated anchoring and accumulation of synaptic AMPA receptors (AMPARs). Finally, prolonged oAbeta$ treatment-induced CaMKII misactivation leads to dendritic spine loss via the destabilization of surface AMPARs. Thus, our study demonstrates that oAbeta$ engages synaptic metaplasticity via aberrant CaMKII activation. 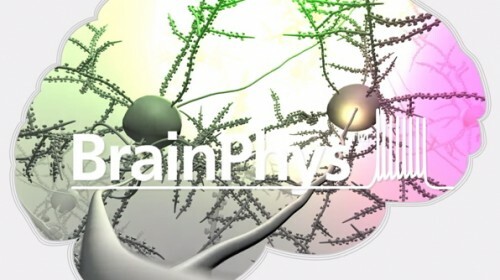 BrainPhys is a registered trademark of the Salk Institute for Biological Studies, used under exclusive license.